Can vector shapes have fills? I'm trying to create a menu background for an app in Clip Studio. I'm trying to figure out the best way to create vector shapes that are filled with solid colors. I can kind of do it using word balloons, but they force every balloon to have an outline and it's hard to adjust the colors. This project that would have been easier to do using Adobe Illustrator, but I no longer have a license to that and thought that Clip Studio might work instead. 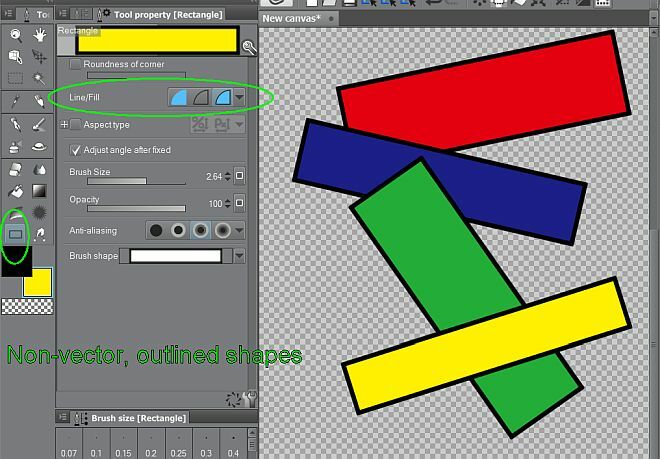 Is there any way to create a vector shape on a layer, assign it a color or a texture fill and then tweak the control vertices to get the shape I want? ( inexplicably bizarre ) reason, it does not fill vector shapes on a vector layer. For me the option to fill shapes is grayed out when on a vector layer. You can sort of cheat the system by using the balloon tools: these are also vector, but have fills as well. It is not a perfect workaround, but the tech is there. For basic shapes it works, but no gradients and other stuff is possible, though you can clip normal layers on them for painting etc. If it were me, I'd create a vector layer like @mechanaut using the figure tool on the vector layer, then make it the reference layer> create a layer beneath for color. In the tools property palette for whatever tool (paint bucket, gradient etc...), check "multiple referring"> choose the little lighthouse, then fill your color layer. Next, I select both layers and in the layer menu choose "Create Folder insert layer" then you can treat it as a single object as long as the folder is selected. if it's too much work, create an action for it, but there may be and easier way, but this was off the top of my head. Doing all the fills on a raster layer defeats the point of using vectors. I want to use vector shapes so that I can tweak their control points and move things around to try out different designs. By using raster fills, you pretty much have to redo all your fills any time you decide to tweak the vector points. @kitfox I see your "point" pun intended. I guess @mechanaut 's Idea would be the best.